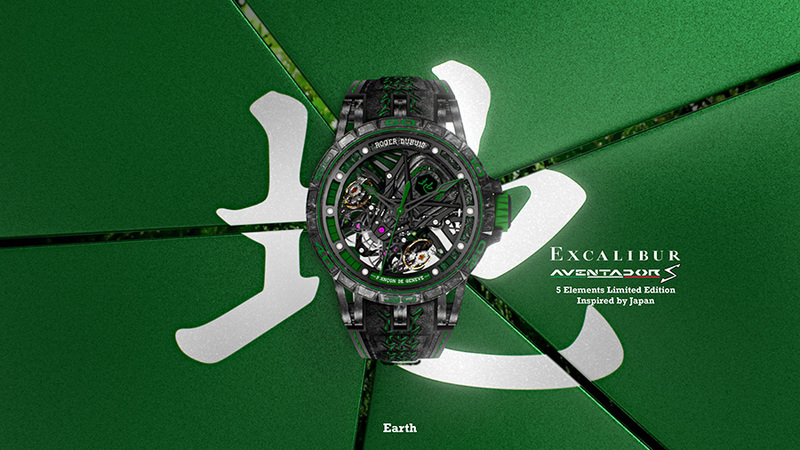 The spirit of five unique cars reincarnated in five outstanding timepieces. 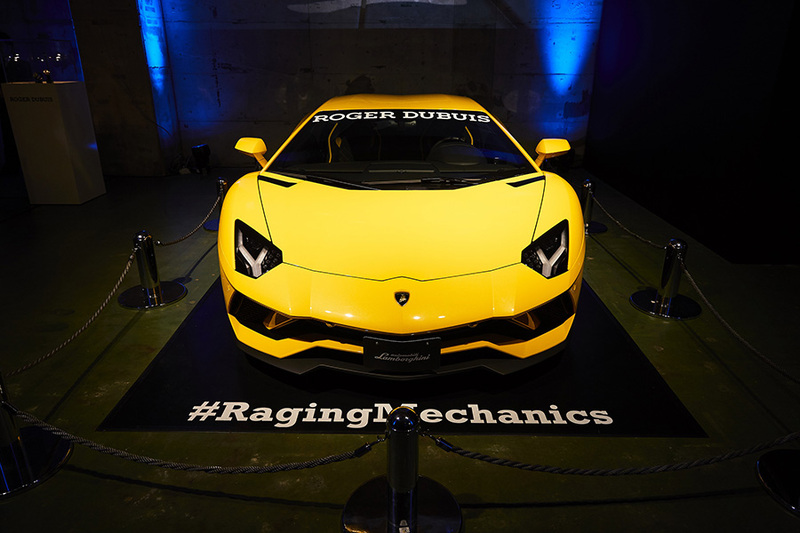 Roger Dubuis celebrates the official Japanese launch of the “Powered by Raging Mechanics” partnership between the iconoclastic Geneva watchmaker and iconic super car manufacturer Lamborghini Squadra Corse. 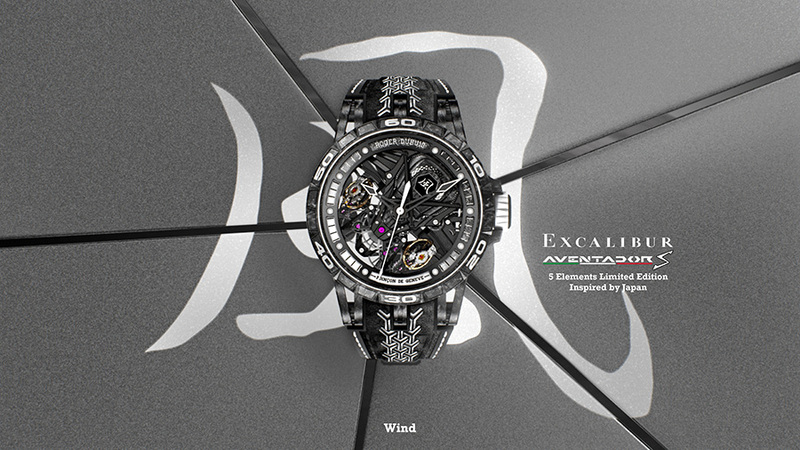 Inspired by the latter’s 2017 rapprochement with Japanese culture that led to the launch of a unique one-off roadster, the incredible watchmaker takes up the most recent challenge posed by visionary engineers and pays tribute to the five natural elements in Nihon culture with a unique limited-edition series of the partnership’s Excalibur Aventador S watch. 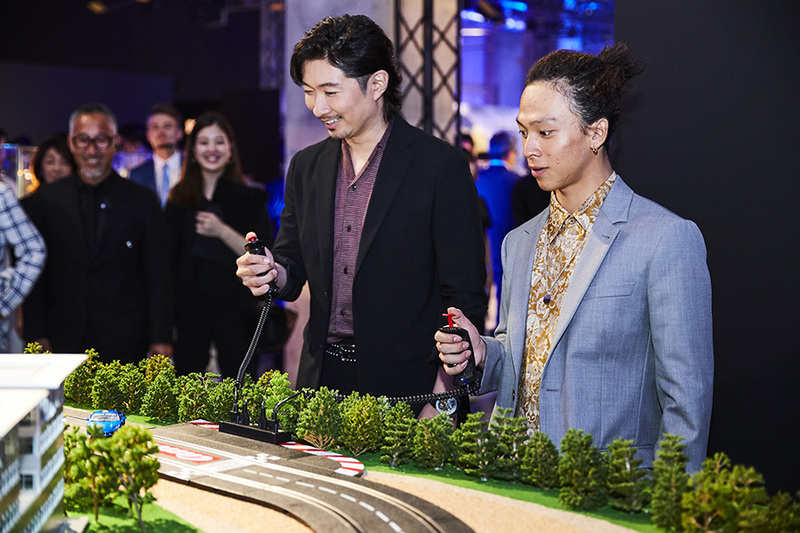 For Roger Dubuis, Japan was both a logical and instinctive choice of location in which to celebrate its partnership with Lamborghini Squadra Corse. It represents a key region for the Manufacture, which holds a deep respect for this age-old yet consistently cutting-edge culture. Among other aspects, it has been deeply impressed by the natural elements (water, earth, wind, fire and sky) so powerfully present in the essence of this fascinating land. 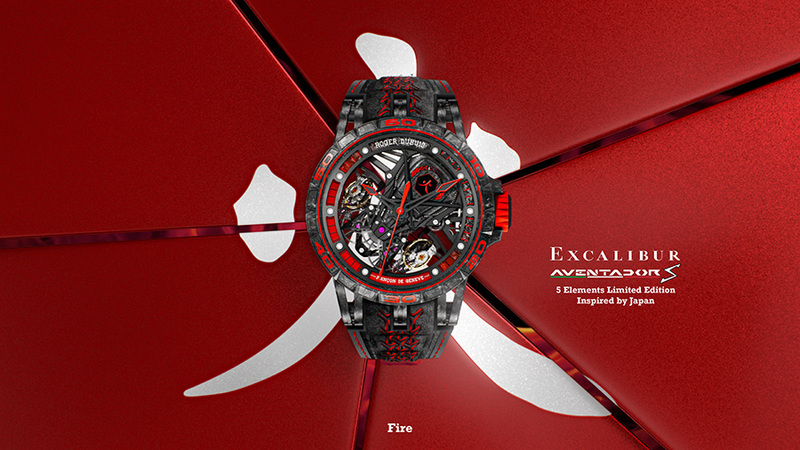 The spirit of five unique cars reincarnated in five outstanding collectors’ timepieces. Late 2017, Lamborghini Squadra Corse toasted its 50th anniversary in Tokyo with the launch of the Aventador S Roadster 50th Anniversary Japan: a limited series of five unique cars representing the five elements. The first is a dark blue shaded version linked with water, and the others will be presented in November. Each is one-of-a-kind. In 2018, Roger Dubuis joins with Lamborghini Squadra Corse in celebrating Japanese culture and its key values of respect and strength through the introduction of five spectacular watches likewise inspired by the five elements. Fusion takes on a whole new meaning. 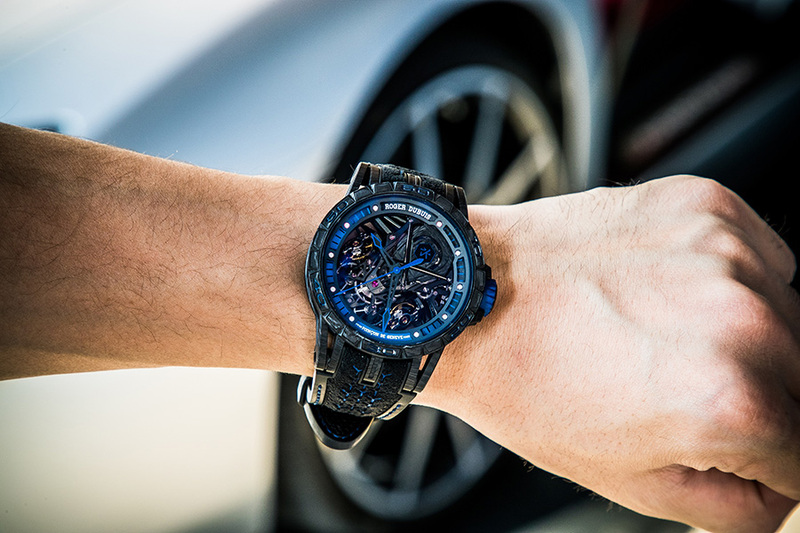 Roger Dubuis’ track record for providing unique customer experiences takes a lot of beating. 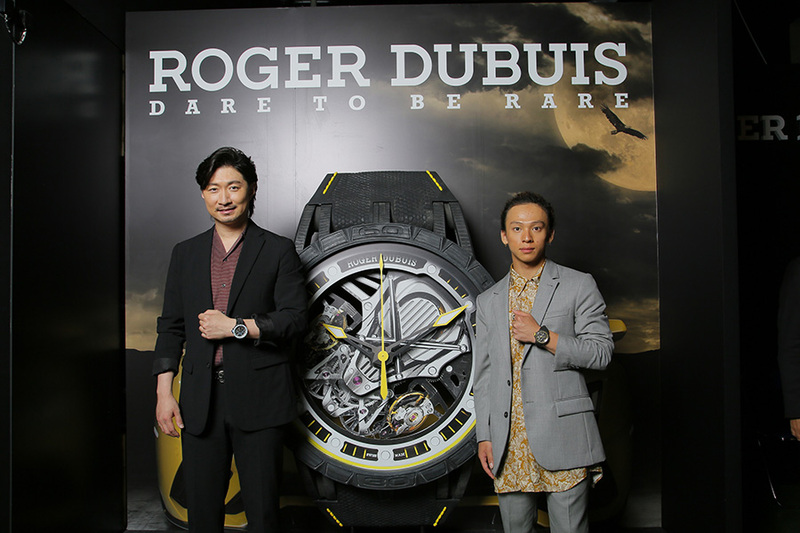 The three-day Japanese launch event will see all the brand’s legendary disruptive force being brought to bear and adrenalin levels reaching new heights as Roger Dubuis once again outdoes even itself. Taking place from June 1st to 3rd 2018, the typically atypical blast-off for this explosive limited series is being staged in Tokyo’s underground Terrada Space, a venue in stark contrast to the sleek design of the Lamborghini Squadra Corse and the Excalibur Aventador S timepieces themselves. Here, in the heart of this rough, raw and virile setting enhanced by motorsports-inspired design elements, a lucky few will sit down to dinner surrounded by the ultimate Lamborghini supercars, including the Huracan Super Trofeo Evo. The original and varied entertainment will include an incredible display of light painting merging guests with their favourite elements, as well as a performance by a soprano freshly flown in from Rome to provide the ultimate Italian touch. Their adult colleagues took to the track at 4.00 pm, with Grid 1, reserved for pre-war vehicles (1923-1939) marking the official start of the 9th edition of Le Mans Classic. Sébastien Loeb and Felipe Massa together waved the French flag, signalling that man and machine were free to take on the Le Mans track. The grids would follow one another in lining up until the following afternoon at the same time. Automobiles were the stars of the show, not only on the track, but in the paddocks and the Le Mans village. In one corner, the hammer of Artcurial Motorcars fell to close bidding on a Mercedes Roadster 300 SL at €3.1 million—a record price—elsewhere, at the DPPI boutique in the village, the public was invited to preview a new book, Car Racing 1965, volume 1, published by the Éditions Cercle d’Art and the agency DPPI Images. This handsome tome brings together a selection of photographs, captured on the road and track, from the famous agency’s unpublished archives. Five patents. Powered by a brand-new calibre co-developed with Lamborghini Squadra Corse, and dedicated to this collection only, this latest world premiere in the Excalibur Aventador S line-up is the proud bearer of no less than five patents inspired by motorsports. The robust 45 mm C-SMC carbon cases of each model feature design cues drawn from Japanese culture and the inspiration it also provided to Roger Dubuis’ Raging Mechanics partner. 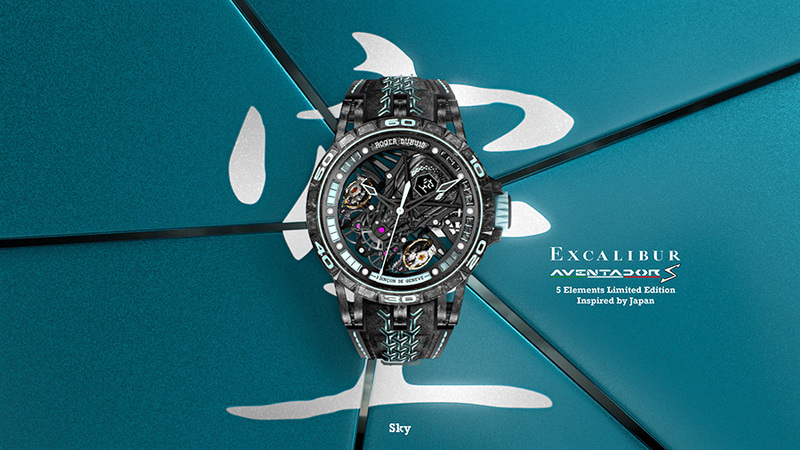 This approach involved a powerful personalization element which presented a similar set of daunting technical challenges for both watchmaking and automobile engineering. In addition, all the straps reminiscent of Lamborghini Squadra Corse upholstery feature Nero Ade black leather and black Nero Cosmus Alcantara, as well as the Y symbol for bamboo in Japanese culture and stitching matching the colour of the exterior. 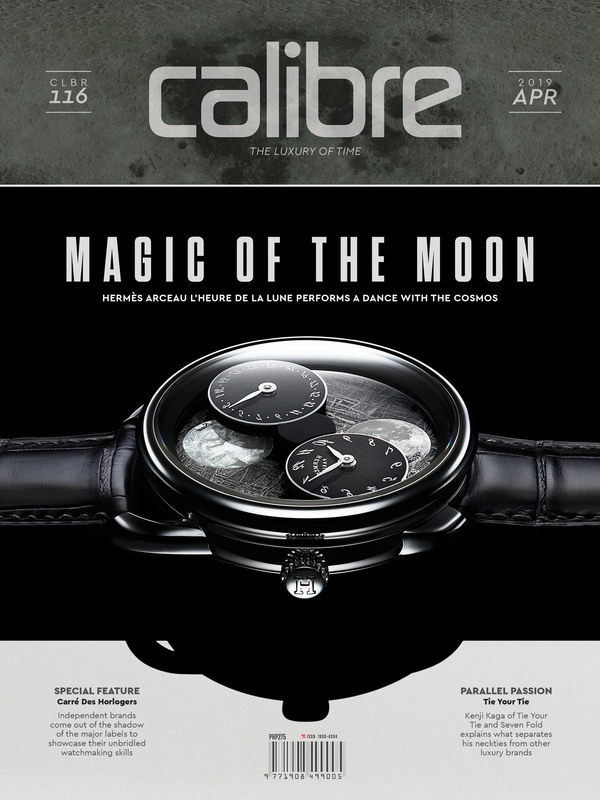 Just as on the cars, the calibre is characterised by a hexagonal carbon plate with the calligraphed Japanese symbol of its elemental namesake. 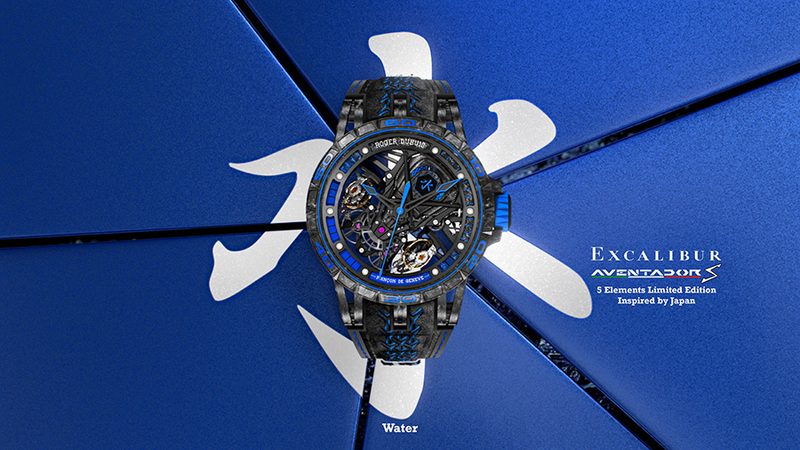 Packed with the usual Roger Dubuis cocktail of world premieres, exceptional locations and unique experiences, this time coupled with a savvy infusion of Japanese subtlety, the launch of the latest Excalibur Aventador S promises to be yet another unprecedented victory roll.